Someone might be wondering why the fuss about French press coffee? A French press enables extraction of coffee directly from fully immersed coffee grounds, and the result is a tasty and rich cup of coffee that has zero contacts with plastic outlets or paper filters. The French press is innovative methods of brewing coffee, and superior quality and taste can be achieved using the best French press. However, finding the best French press coffee maker can be difficult and as a result; we have carried out extensive research to find the Top 10 Best French Press Coffee Makers that are extremely affordable and worth trying. Just follow us as we take you through a priceless path of the review! It is everyone’s dream to have super quality coffee and making use of French press coffee makers can bring this desire to reality. However, finding the right French press can be challenging, in the sense that, what is another man’s meat is another man’s poison. Taste and preference differ in scale and situations. On this note, before you buy your French press coffee maker, take the followings into consideration. Am I a TRAVELER? Consider if you are someone that’s always on the road, if so; then consider an all-in-one French press travel mug where you can brew the coffee right in the mug. These types (like the Bodum) are usually sleek in design, and a classy one will fit properly in the drink holder of your car. Once done, you can continue your journey to Lilliput! Are you CAMPING? If the French press you aim to buy is for camping purpose; then you will have to consider the durability and portability, otherwise; you will find yourself pulling pieces of broken glasses from your luggage and from around you like someone savaging his losses in the aftermath of a terrible tsunami. Do you love seeing through the DARK? If you’re the type who always want to see what goes on inside his/her food/drink pot; consider buying a French press that’s fully or partially transparent, unlike the fully stainless silver types that normally conceals the civil war taking place inside the pot. Now, you’re done with considerations: it’s time for the money to speak! At last, we are here! Go through and make your choice! 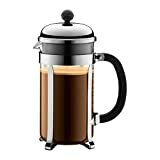 GROSCHE Madrid French Press Coffee Maker, Tea Press Coffee Press 1.0L / 34 oz quality Pyrex France glass, stainless steel coffee filter. The best French Press for tea with gorgeous attractive design. We start our list of Best French Press Coffee Makers 2019 Reviews, with the Bodum Chambord 8 Cup 34 Ounce French Press Coffee Maker. This product serves two to three people at a go. 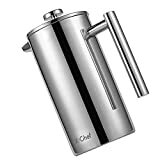 It has a stainless steel frame, a heat resistant glass carafe and a handle that’s also resistant to heat. There is a 3-part stainless steel mesh that helps to extract your coffee without stress while retaining the maximum amount of flavor from your coffee. Every part of this French press is safe on dishwater. It looks they can be deceptive, but not with this awesome French press coffee maker. This product comes with an overwhelming sleek design with the ability to brew 1 litre/34oz of the best coffee you can think of. It has outstanding interior and exterior mirror brush finish, making it a perfect addition to your kitchen. The double wall composition of this coffee maker ensures it retains heat and keeps your tea or coffee warm for a longer period. It can serve two or 3 small families. If you’re looking for a true premium quality French press coffee maker, you have found it! Made in Germany, this model has a dual filter system that better secures your coffee and retains enough heat to keep it warm. You can turn the lid to close the press while your coffee steeps and turn it again to open and extract it. This is truly premium quality unlike any other. The minimalistic chrome housing further provides stylish design suitable for any kitchen. The Madrid French Coffee maker can produce a liter of coffee in a single press. To get the perfect cup and quality coffee every time, trust this Culinary Prestige French Press to solve your coffee needs within 4 minutes. Experience full flavor aromatic coffee with no grinds by its double screen filter system. It’s eco-friendly while directing every ounce of your coffee’s oil right into your cup. This design consists of 18/8 stainless steel with chrome finish and perfect handle—the perfect thriller for your guest and gift to your loved ones. Get 1 liter of coffee from the Kitchen Supreme French Press with stainless steel design for your sugar, honey, and dessert. This is the ONLY French press coffee maker with FOUR FILTER SCREEN system that will totally eliminate all grounds from your coffee. The model has a real 100% stainless steel lid and a carafe that will never crack as a result of being made from double German glass. It comes with an instruction manual, and the packaging is eco-friendly, plus 5 years warranty. Have you been buying coffee filter paper before? No more, as this LINKYO coffee maker ensures that with its reusable BPA-free stainless steel filter screen system, and additional two bonus systems. This coffee maker is very easy to use and clean up. The double wall construction with corrosion resistance food grade stainless steel ensures there will be no more broken carafes. LINKYO’s beautiful design makes it perfect for your kitchen, with two years guaranteed to boost. Now, you can celebrate the pure flavor of coffee by using Freiling’s high-quality double wall insulated coffee maker capable of retaining heat four times more than a glass press to keep your coffee warm. The 18/10 stainless steel design smartly overcomes the problem of breakable glass carafes while staying durable for long. You can also keep your coffee or juice cold, not just hot, by using the pitcher. All it takes is just 4 minutes, and you’re set to taste the best coffee ever. Ever wonder what kind of coffee press won the hearts of all coffee lovers in the market? Are the most durable and reliable ones? The ones that resist heat and keep your coffee warm at length: and this is just what the Sterling Pro Coffee Maker is all about! Design with durable and heat resistance borosilicate glass; this model will give you the best tasty coffee brew measuring 1 litre-34oz at a go. It is very strong in removing grounds from your coffee, even as the double screen system ensures you have the smooth cup of coffee. It’s a parcel worthy gift for your friends. For all coffee and tea lovers, this is your perfect gift. 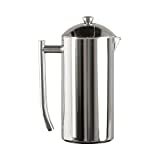 Boasting a stylish design with mirror finish, this French press is perfect for your kitchen and office counter. Sterling Pro is the first French press to use double screen system and is far more superior to most other products in removing grounds from your coffee. The double wall construction ensures your coffee stays warm for a long time while providing excellent taste and flavor. You can’t miss out on this product. In every classroom, there is a perfect, and the KONA French Press Coffee Maker stands out as the greatest in our Top 10 best French Coffee Press Makers 2019 Review; and the reasons are obvious. The best and surest way to determine the quality of any product is through numerous reviews from real users of the said product. With over 10 thousand customer reviews, the majority of which are positive; the KONA stands as our number one best French Press Coffee Maker in the market today. Boasting the purest way to extract and brew your coffee, this model has outer shell protection that protects the glass pot from cracks and chips. The handle is sturdy, durable and compliments the overall design, which is also easy to clean. Surely, this is the best of them all. The best French Press Coffee Makers are those that are durable, sturdy and ensure safety and warmness while pressing or keeping your coffee. 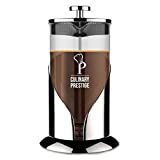 From our reviews of the Top 10 Best French Press Coffee Makers 2019, you now have a better understanding of what lies in the market. And if you will prefer our recommendation, although all items reviewed above are classic in their respective capacity; we prefer that you should go for the French Press Coffee & Tea Maker Complete Bundle, or the KONA French Press. The reason is that: while the formal is the only French Press Coffee Maker to have Four Screen System, the latter is the most reviewed product in the market.